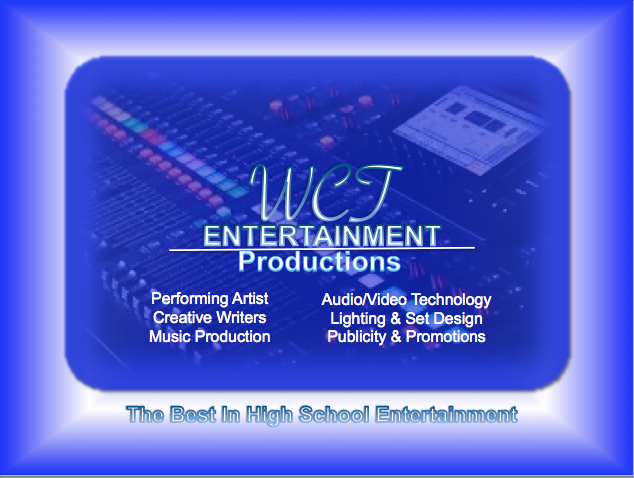 WCT Entertainment Productions is a full service High School Entertainment Production Company directly related to the Career and Technical Education’s Music Production Course here at West Caldwell Tech. Students are engaged in all areas of entertainment, including but not limited to, Performing Arts, Audio/Video Technology, Lighting and Set Design, Creative Writing, Music Production and Publicity/Promotions. Participation in the program gives each student a real life industry experience in the operation of a full service entertainment production company. It also helps students build character; learn to work as a team and take individual responsibility and accountability for the completion of their role in each and every project. Students will take this course and will leave with much more confidence and heart to be themselves, as we inspire the students in this course to be yourself in a creative way. That is a big mission. "From a great vocal performance, to creating music for commercials, to performing on stages around the world, I truly believe that there is nothing that my students cannot achieve"
WCT Entertainments Studio303 takes on the new Focusrite "Rednet" Audio over IP (AoIP) networking system. "We are now able to take our multitrack recording process to the next level", says Mark Beckett, the Performing arts/Music Production instructor. All of our performances that happen on stage in the gym, which is in another part of the building, can now be recorded right in the classrooms new Studio303. This is an exciting time as we continue plans for the opening of our new State of the Art Vocational school, Essex County, Donald Payne Tech, in 2018. Welcome to the Essex County West Caldwell Tech Entertainment Productions website. We are excited and pleased that you stopped by to share in our creative work. "Connecting to College and Career" is the theme of the year!!! We are definitely looking ahead into the 2017-2018 school year with a much more expansive mindset. WCT Performing Arts has expanded its courses to include more music technology into its productions. With the implementation of a full service High School Entertainment Production company, which is directly related to the Career and Technical Educations music production course, students are engaged in all areas of entertainment, including but not limited to, Performing Arts, Audio/Video Technology, Lighting and Set Design, Creative Writing, Music Production, and Publicity and Promotions. A career and technology based education will help your child to be more than just an average student. Career and technology education can give your child what’s needed to succeed for life: technical skills, academic skills and employability skills. In addition, career and technical education helps students see how what they’re learning applies to the needs of employers. Regardless of whether students are headed for college or the workforce, this type of education will help them prepare for the future. In fact, college-bound students can get job experiences to help them define their career plans, identify an appropriate course of study and help pay for tuition. Just think of the benefits your child will receive by gaining not only a solid foundation in academics, but also hands-on, technical experience and know-how. Class of 2018 Music Production student, Justin Serrano(Jkells), doing the creative thing in Studio303. Using the Behringer X32 along with Logic Pro 10. You need an agent. His or her job is to solicit work for you. It's critical. "Give our Youth a Voice, and they'll Give you an Ear"
620 WCT RADIO is a radio station designed to encourage and motivate our young people of today to rise to a new level of musical, political, social and economic awareness. Too many of our young people are becoming part of our death statistics far to early in their lives and it is time for those who CHOOSE life, to stand up and begin to take leadership and encourage others to be accountable for ones actions.